I've said many times in the past that I think the Microsoft Surface RT is a great device that gets real work done. If the main reason reason you want a tablet is so you can play games on the go, the iPad is the device you want. But if you intend to get real work done and need create and edit documents, spreadsheets, and slideshows on the go, the Surface is the tablet you need. I used my RT to write a blog post and I have to say it was an enjoyable experience. 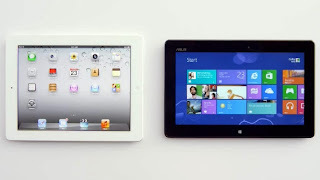 If your needs fall somewhere in the middle and you intend to mainly use your tablet for media consumption (streaming video, music, magazines) any of the current group of Apple, Android, and Microsoft tablets can do all of that with ease. Apps like Netflix, Hulu and Zinio are available on all 3 mobile OS's and there are music streaming apps on all 3 that will fit your needs as well. Your only choice would be screen size in which Microsoft doesn't play in the 7-8" category yet. I think of tablet choices like this: iPads are for young kids or older adults who don't understand or don't need a lot of customization and like the iPad for what it is, locked down and very limited customization. Android tablets are for those young adults who are very tech savvy and can adopt the latest tech trends with ease because they are probably the ones helping to create them. These users will probably adapt and customize their tablets to suit them rather than modifying their needs around a tablet. The Surface would be for the mainstream adults who realize they don't have time to game on a tablet but rather need a tablet to be more productive at work or at home. Yeah sure, they may play a game every once in a while when they find the time but most of their tablet use is consuming news on the go or doing something related to work. It's this last point that Microsoft drives home in their latest ad pitting the iPad against an Asus Vivotab Smart. The ad points out that Windows 8 is good at multi-tasking while the iPad is not. And what do you do when your tablet isn't good at being productive? You play games. The ad also points out that the full Windows 8 experience can be had for $250 cheaper than a comparable size iPad. Wow, Microsoft released another video comparing the iPad to the Asus Vivotab RT. Once again, Microsoft is showing that you can do more for a lot less money using Windows 8 or Windows RT. The Vivotab RT only costs $370.